"SOLID HAND BUILT JARRAH, MARRI (RED GUM) AND PINE FURNITURE"
Matilda Federation Style Jarrah Bedroom. An ever popular style from our Heritage era. Monterey Mission Style QS Bed. SwanRiver Furniture specialises in solid JARRAH, MARRI and PINE Hand Crafted Furniture. Originally situated in Fremantle, Western Australia The Indian Ocean on one side ~ The Swan River on the other. Once known to the early settlers as The Swan River Colony. A region surrounded by once vast Eucalypt Forrest abundant with the remarkable hardwood Eucalyptus Marginata. In those days known as Swan River Mahogany. This beautiful Jarrah timber is now served well by people like me, who source it from various past lives ~old Warehouses and Bridges, Woolstores and Wharves, along with dressed milled timbers and Natural Edged Slabs from fallen trees ~ and craft it into items of distinctive furniture. 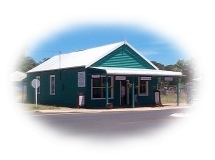 Now located in the small township of NANNUP in the very heart of the Southwest of Western Australia. This is where the tall Jarrah and Marri grow, and the Blackwood river winds its way to Augusta and the Southern Ocean. Although still maintaining the Swanriver Furniture and Phil's Woodwork Shop identities - both are now comfortably housed in my new Gallery/Showroom and Workshop ~ and even more committed to utilising our valuable resources in the most productive and value added way I can. Located in NANNUP ~ the heart of the Southwest. These items will be changed or added to periodically - so keep looking back in. Anything you order from THE NANNUP FURNITURE GALLERY is special - so get on with it!! CRAFTED FROM OLD TIMBERS AND HOUSE STUMPS. And now available with hand forged iron fittings as an added option! Be quick, as this product has been very popular and in great demand....!